There are different forms in which feta cheese is molded and each of these contains different calorie content. The nutritional value in each of these feta cheese form/ preparation is also different. 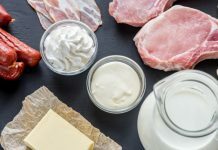 One ounce of Feta Cheese contains a total of 75 calories of which 71% of the calories come from fat, 23% calories come from proteins and the remaining 6% calories are obtained from carbohydrates. The total fat content in an equal serving of feta cheese is 6.03 grams, carbohydrate content in it is 1.16 grams and protein content in it is 4.03 grams. One wedge of feta cheese weighing around 1.33 oz contains 100 calories, one cubic inch of feta cheese contains a total of 45 calories, 100 grams contains 264 calories and 1 Ib of feta cheese has a total of 1198 calories. A one fourth cup serving of reduced fat crumbled feta cheese available from Trader Joe’s contains a total of 60 calories of which 53% of the calories come from fat, 40% calories come from proteins and the remaining 7% calories come from carbohydrates. The total protein content in an equal serving of Trader Joe’s reduced fat crumbled feta cheese is 6 grams, fat content in it is 3.5 grams and carbohydrate content is 1 gram. Trader Joe’s fat free crumbled feta cheese is also quite popular. 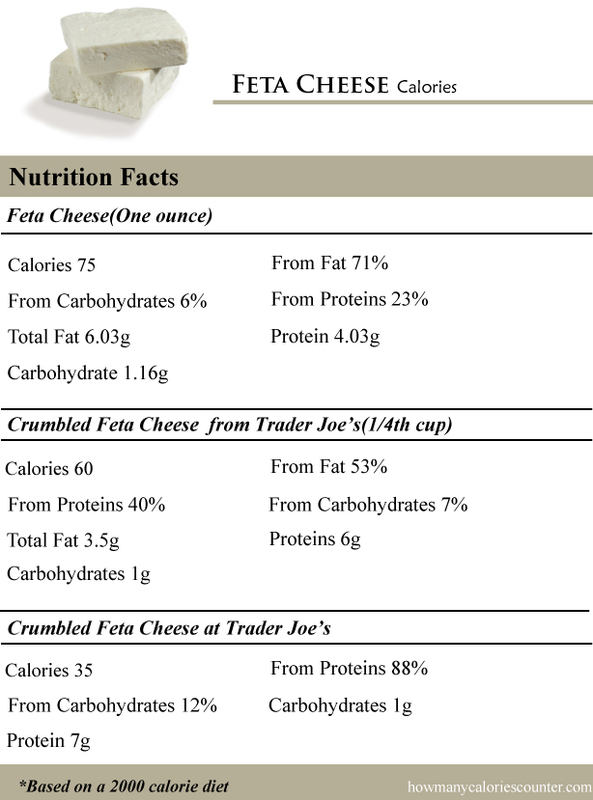 Each serving of fat free crumbled feta cheese available at Trader Joe’s contains a total of 35 calories of which 88% of the calories come from proteins and the remaining 12% calories come from carbohydrates. The fat content in this feta cheese is actually nil. An equal serving of this feta cheese contains 1 gram of carbohydrates and 7 grams of protein content. Athenos Natural crumbled feta cheese is also quite popular. A one fourth cup serving of this feta cheese contains 90 calories.